The Pentahedron is a face-turning triangular prism. It has three triangular layers, which can each turn by 120 degrees. Its three rectangular side faces can twist too, but only by half turns. This leaves only 6!·6!·3! = 3,110,400 reachable positions. I ran a computer search to find out how many moves it takes to solve the puzzle. This shows that at most 13 moves are needed to solve the puzzle (9.8612 on average). Hold the puzzle the triangle faces at the top and bottom, and one of the side faces towards towards you. A clockwise turn of the top or bottom layer will be denoted by the letters U and D respectively, anti-clockwise turns by U' and D'. A half turn of the Left, Front, or Right face will be denoted by L, F, and R respectively. Phase 1: Solve the middle layer. Look at the colours of the left and right face centres. Bring the edge with those colours into position at the rear or the middle layer. If it is flipped, do R F L.
If the other two middle layer edges need to be swapped, then do an F move. If the front two middle layer edges are both flipped, then do R L R F.
Phase 2: Solve the corners. If the three corner pieces in the top layer all have the same colour on top, then do F U F.
Turn the U face so that at least one corner is solved correctly. Find a corner piece in the bottom layer that belongs in the top layer. 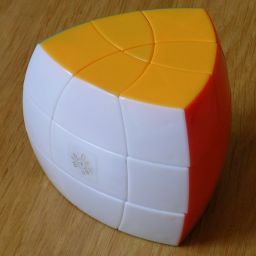 Hold the puzzle so that the location this corner piece belongs is at the top front right. Turn the D layer so that the corner piece lies below its destination, at the bottom front right. Do the move sequence D L U' L to insert the corner. Repeat steps c-f until the top layer corners are solved. Turn the bottom layer if necessary until its corners are solved. Phase 3: Solve the front layer (top and bottom edge). Find the edge piece that belongs at the top front location. If it is already solved, skip ahead to step d.
If the edge piece lies in the top layer, then do RLRLRL to bring it to the bottom. Turn the bottom layer to bring the edge piece to the front. Do FRFRFR to solve the piece, and if necessary turn the bottom layer so that its corners are correct again. Find the edge piece that belongs on the bottom front. If it is already solved, skip ahead to the next phase. If the edge piece lies in the bottom layer, then do RLRLRL to bring it to the top. If the edge piece lies at the top right then do D, and if at the top left then do D'. Then do RLRLRL to solve the piece, and finally turn the bottom layer back to how it was before. Phase 4: Solve the remaining edges. Take a look at the top and bottom faces, and see which parts are the wrong colour. The side face colours are completely ignored for now. Top Left, Bottom Left: do FLFLFL U'LU FLFLFL U'LU. Top Right, Bottom Left: do U'LU FLFLFL U'LU FLFLFL..
Top Left, Bottom Right: do URU' FRFRFR URU' FRFRFR. Top Right, Bottom Right: do FRFRFR URU' FRFRFR URU'. Top Left, Top Right, Bottom Left, Bottom Right: do RLRLRL. If the side faces are still not solved, then do URU' RLRLRL URU'.